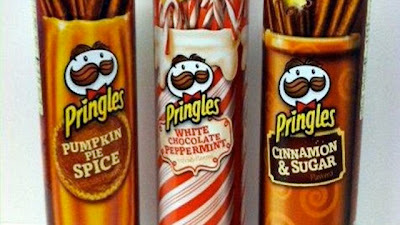 Pringles have never landed on obsessivesweets before because they stand in savory opposition to the sugar-focused viewpoint of the blog. 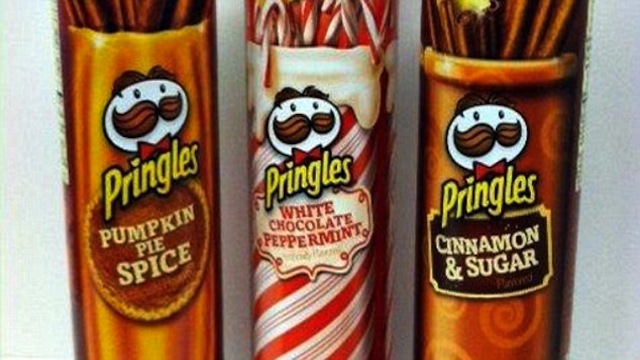 However, for the upcoming Thanksgiving and Christmas holiday season, gawker.com reports that Pringles are shifting from savory to sweet, introducing three new flavors: Pumpkin Pie Spice; White Chocolate Peppermint; and Cinnamon & Sugar. I think these could be quite tasty! A little salty crunch at base with a sprinkling of pumpkin, peppermint, or cinnamon flavors could constitute the ultimate munchy snack. I like those baked pita chips sprinkled with Cinnamon and Sugar and these might be similar. Although a little wary of the pumpkin, I'm excited to try all three new varieties.